Whether new to the business or a seasoned professional, this handbook provides actors with a personal, active approach to discovering and developing their talent. 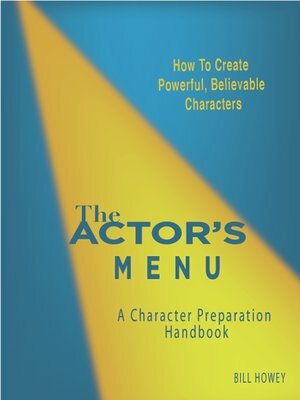 Beginning with appetizers and ending with desserts, actors learn how to prepare a character in the same way that a master chef chooses the most complementary dishes for a feast. From typecasting to reinventing a character's story, actors discover the key ingredients that will enable them to use their own unique qualities and emotions to develop strong, believable characters that people are interested in watching. How to identify and resolve problems such as hidden agendas that can disable an actor's work; distinguish between perception, feeling, and emotions; and find lasting sources of inspiration are among the issues explored. The importance of imagination, words, and story as well as the difference between intellectual and visceral choices (and the impact of each) are also discussed.